Green Momster: How's our National Bird doing? How's our National Bird doing? 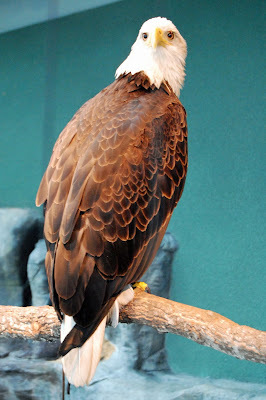 For Memorial Day, we’re going to take a look at an endangered species success story – the bald eagle (Haliaeetus leucocephalus)! Who doesn’t love seeing our national symbol (since 1782) flying majestically through the skies? I know that one of the high points of our recent visit to Chincoteague NWR was seeing the beautiful bald eagle fly above us as we biked the island. But views of bald eagles weren’t always so common. According to National Geographic News, there were only 417 nesting pairs in 1963. Many attempts were made to try to protect bald eagles, including the 1940 Bald Eagle Protection Act and listing under the Endangered Species Act of 1973, but it was the banning of DDT that really helped the recovery of these birds.